As I was reading Robbar, the special supplement of Pratidin I recalled the picnic-calendar of my growing up years in Bengal. The arrival of winter and regret of its non-arrival would lie in the stapled packets of Band-Box or Shantipur Shawl Repairing House packets lying in the Godrej Almirah and the ultimate plan to organise picnics. The advent of winter would mark the task of writing essays on Charuibhati, Bonbhojon (Bengali words for picnic) in Bengali classes and to drawing competitions organised by local clubs on topics related to these. By December, calendar dates particularly Saturday and Sundays would be blocked for picnics. Like one of my roommates commented, a green patch, a strip of water is all that a Bengali family needs to set out for picnic. Geared with outdoor game sets of flying discs, badminton rackets and cricket bats, we set out for those picnics in matador vans, cars, buses, and trains depending on the nature of the organisation. As children you tagged along with grumpy faces and the pressure of being well –behaved. In my case, my mother reminded me constantly not to take a second helping. Picnics in those days started with tiffin and ended with evening tea. Tiffin or breakfast on arrival would be slices of white bread sandwiched with a cube of butter, a boiled egg with shells on and a nice big singapori kala ( banana). Depending on the budget and the urgency to retain Bengali-ness there would be a nalen gur sandesh “date-palm jaggery sandesh” in the tiffin. Slices of cakes smelling of cherries ( this was pre- Monginis and Sugar & Spice Outlets – two brands that popularised confectionery items across Bengal) and oranges accompanied a cup of milky “nescafe” coffee mid-way between “tiffin” and “lunch”. Lunch would be Rice and Mutton Curry followed by tomato chutney. One had to dutifully put on the monkey-cap and sweaters while playing badminton for Bengalis are prone to catching cold even in temperatures which never hit beyond 15 Degree Celsius. Any outdoor activity in Winter (December – February) meant hand knit woollen gears. Such gears came in matching pairs and picnics were an occasion to dress up in those gears that our mothers, aunts dutifully wove the year before. The torture and pleasure of being an adolescent and a little respectable came with staircases, lawns being given away to organise group picnics among your own age –group. This was the tasting time for all the observed skills of cooking you have acquired while being scolded for upsetting the order of cans and jars in kitchen. Menus of such picnics would be khichuri, chicken curry, rice and brinjal fritters ( beguni) .The group picnic site would be the terrace of a gentle kakima would come to the rescue when you have messed up or a gentle kaku who would negotiate on your behalf to the loud speakers that would blare out from the staircase. This was oposanskriti ( out of culture; literally). Such defiance could increase if you became part of Tarun Sangha or Borun Sangha from your neighbourhood and took a matador ride with utsrinkhal chele ( indisciplined boys) for a picnic to a picnic spots. There are designated picnic spots across Bengal and to support what my roommate said, most of them are located against the backdrop of a waterbody. Such matadors would have two speakers in the front and back blaring out latest Bengali and Hindi Film Hits. While men and young boys were allowed to join such picnics, women were refrained taking part in such activities. Apart from the matador rides, remained family picnices by cars, hired buses or even train compartments. One of my favourite picnics was an all girl’s picnic led by Pishimoni. Father’s Sister is called Pishi and Moni is an endearing way of addressing. To this date, I don’t know why we called her pishimoni except for the reason that my father called her didi ( sister) but she was my mother’s silaididimoni (craftsteacher). Pishimoni ran a shift crafts-school from our drawing room. On Thursdays, the sound of the singer machine would fill the air of the house and there were women across age –groups whom Pishimoni supervised with their needlework, knitting and craftwork. Except for the sound of the Singer Machine, there would be a pin-drop silence on Thursday afternoons. Pishimoni’s bag was a box of goodies as she would carry candies, nuts and other stuff from her regular train journeys to Kolkata, and other places. She took recourse to needle work and teaching women after her divorce. While our mothers were scared she adored us and we waited for the seasonal gifts that she brought us. Pishimoni used to organise a picnic and this was the best picnic. The kids (particularly I) had a say in the picnic menu and I loved the way she took take of the entire thing. Once my father wanted to join us as we were visiting this newly discovered “picnic spot” she said , Bhai ei ekta jayga to amader jonno chchere dao ( Brother, leave this space for us). Though I did not understand what she meant, looking back, I cherish this all girls picnic. This picnic was Pishimoni’s way of teaching us to be independent of having our own tarun sangha and borun sangha with no matadors or blaring music but a space that my mothers, kakima called their own- a day to themselves. Do you want to unwind a busy day with piping hot crab curry with steamed rice in a chilly winter evening in Delhi without leaving a hole in your pocket? If you like to savour street food and looking for some delectable items from across India head to National Association of Street Vendors of India’s (NASVI) Street Food Festival which has opened yesterday in Jawaharlal Nehru Stadium Premises. NASVI has been championing the rights of street food vendors and has been instrumental in campaigning for the Vendors (Protection of Livelihood and Regulation of Street Vending) Bill, 2012 which was recently passed in parliament. 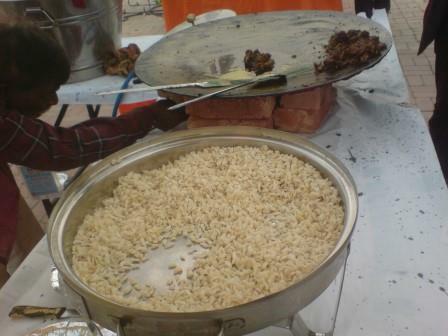 (http://www.thehindu.com/news/cities/Delhi/a-historic-day-for-street-vendors/article5103508.ece) NASVI has been instrumental in bringing to the capital’s food lovers street food across India for the second consecutive year. The street food festival has brought together street foods from Kerala, Tamil Nadu, Andhra Pradesh, Madhya Pradesh, Bihar, Orissa, West Bengal, Punjab and Rajasthan for a three day extravaganza – a treat to city’s food lovers. Last afternoon J, C, M and I trekked down to the street food festival. 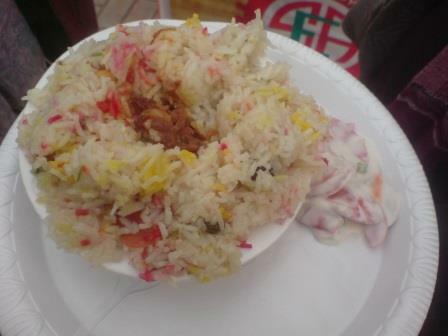 We started our food trail with ghee pulao and chicken curry from the Kerala stall. The long grains of rice coated with ghee and the tender succulent chicken cooked neatly wrapped with spices to beat off Delhi chill was a perfect start to the street food trail. The creamy raita (beaten and seasoned yoghurt) with a mix of onion, cucumber and green chillies blended well with the ghee soaked rice and spicy chicken. 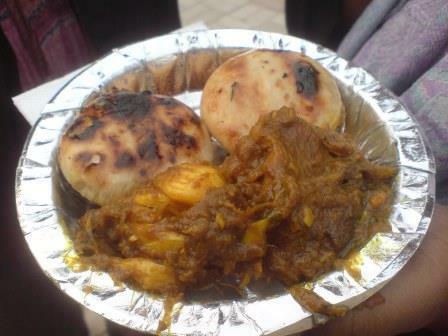 And all for RS 100/-A perfect start for the hungry souls! 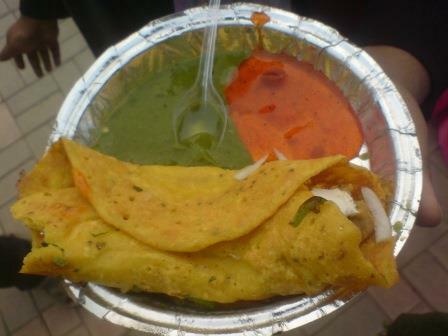 Our next stop was Moong Dal Chilha with a filling of spicy potato and paneer (Rs 50). 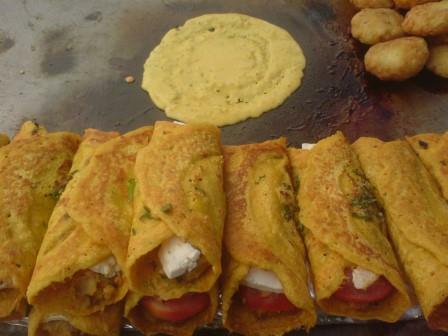 Personally I am not a paneer fan but the Moong Dal wrap seemed like the perfect snack, lunch item. Served with mint and coriander chutney and tangy sauce this truly took me by surprise. I strongly recommend you to try this! We thought of taking a break and stopped by to see a roller ice-cream machine at work. Though the texture of the ice-cream was nice, the rose essence put me off. If you like rose essence and want some fresh ice-cream (Rs 50) being churned out you can give it a try. Then we headed to the award winning team of Chicken 65 to spice up our taste buds. If you are a fan of fried chicken with no frills, you are bound to fall in love with this layered dish of crispness at the first bite, juicy spices at the second and then it melts into your mouth. Chicken 65 is a perfect accompaniment with a steaming cup of chai or “spirits” as well. So if you are planning to throw a pre-Christmas party tomorrow, pack some Chicken 65 from this stall or pack yourself a treat to unwind a weekend evening. Next stop was Litti- Mutton. 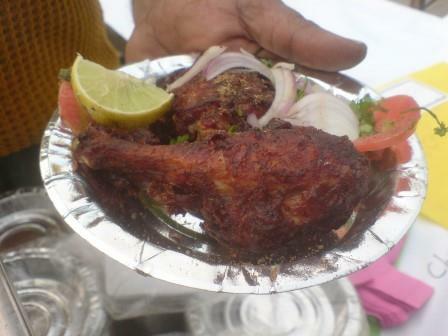 To my mind, NASVI’s street food festival has brought out the best of Bihar’s street food to the capital’s food lovers. This time, street food festival has three stalls from Bihar, one serving Litti- Mutton and Litti- Chokha and the second serving Litti –Chicken and Litti-Chokha. We treated ourselves into piping hot littis with dollops of ghee from both these stalls. And even got it packed. If you are a garlic fan try Litti Mutton. The mutton curry has a fainting fragrance of mustard cooked with whole garlic soft with the spices … it leaves you yearning for more. Must Try ! The sattu mix of the Litti –Mutton was a little bland compared to Litti-Chokha we had from the stall serving Litti- Chicken. The mix had the perfect blend of mustard oil and pickles. 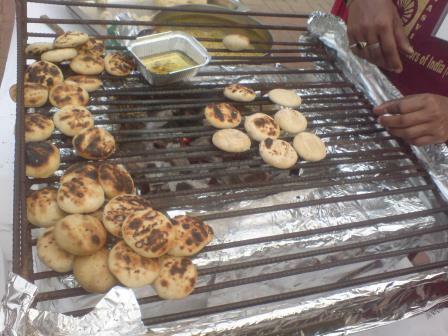 My mouth waters as I recall the taste… Pack yourself a box of Litti – Chokha if you are full with Litti- Mutton. After our litti trail we decided to take a break. We thought of taking a break and headed for our evening chai ( tea). After a chai– break we headed for Chura with Taas Kebab from Motihari ( East Champaran) which reminded me of buff kebab, spiced chana served with chura in streets of Kathmandu. The tender, soft pieces of chicken kebab served with crisp chura brought me back memories of my lunch on Kathmandu streets and unveil a completely different side of Bihari street food. I don’t recall tasting Chura with Taas Kebab in last year’s food festival so this was a welcome surprise. I was a little disappointed with my home turf – West Bengal which is known for its street food starting from rolls, chop to rice meals. 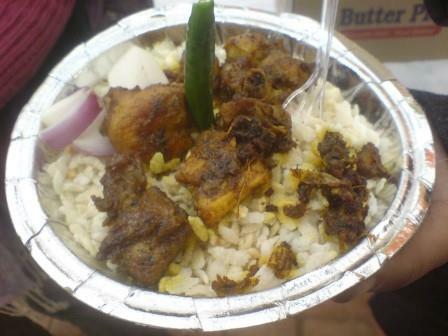 The West Bengal stall had varieties of fish and rice. 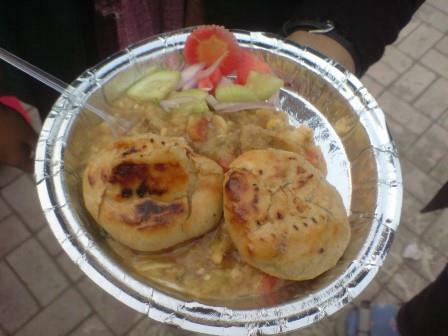 I wish winter varieties of ghugni and peas kachori with alur dom was there. 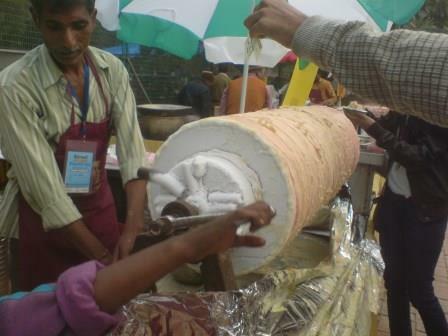 For sweet lovers there is a stall fom West Bengal serving date palm jaggery sweets and Assam stall serving pithas. Other than these, there there is a grand spread from Maharastra, Bhopal, Tamil Nadu which we failed to explore. Starting from Makki Roti to mirchi pakora, there are ample choices for lunch, evening snack or dinner. So beat the winter chill with street food festival. Till then happy eating ! How to reach : Nearest Metro Station – JLN Stadium on Violet Line ( Central Secretariat-Badarpur). Get out from Gate No.3 (Exit) and JLN stadium is round the corner. Entry Fee: Rs 30. You can even buy coupons online else from the ticket counters at the entrance of JLN stadium. Payment by coupons: Stock yourself with cash as they do not accept cards. There are lots of coupon counters so buy coupons when you need them. Check NASVI’s fb page https://www.facebook.com/Nasviindia?fref=ts.